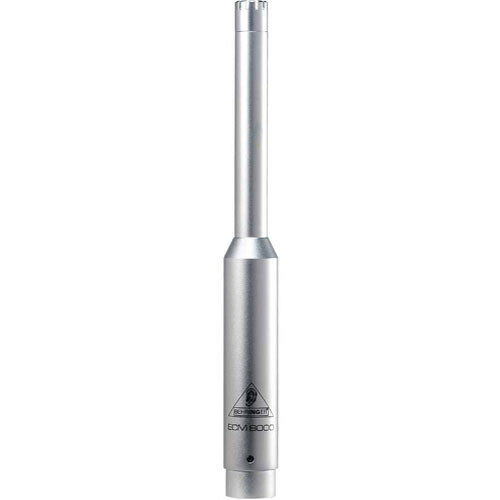 The ECM8000 Ultra-Linear Measurement Condenser Microphone from Behringer is an omnidirectional mic designed for use with real-time analyzers (sold separately) to provide an acoustic picture of a room. It can be used to capture audio and fine-tune your sound system performance to match the response characteristics of the room for recording applications. In addition, the ECM8000 requires phantom power (+15 to +48V) and includes a swivel stand mount along with a rugged carrying case. Box Dimensions (LxWxH) 12.0 x 5.25 x 3.55"
ECM8000 Ultra-Linear Measurement Condenser Microphone is rated 4.5 out of 5 by 23. Rated 4 out of 5 by Hank from Worthwhile This is in my opinion one of Behringer's better entries. At the heart of this mic is a quality Panasonic capsule, very flat, and probably as close to true omni as you can get. Most omni mics aren't nearly this spherical in their pickup pattern. The one drawback with this mic is its self-noise; Compare it with most any quality condenser and you'll see what I mean. This noisyness seems to be typical of this type of mic, even the more expensive ones, Earthworks, etc. It's still extremely useful, just best used with louder sources, so less gain is needed. Very natural sounding acoustic instruments; I used this as drum overhead on latest project thru GrooveTubes brick tube pre, loved it. I'll probably get another one for split omni use. I even used it once for its intended purpose of EQing a room! Rated 2 out of 5 by Barish from ECM8000 Low and mid frequency response is good. High frequency response is not as precise and the self noise level is not low as is expected from a measurement mic but hey, it costs less than 50 bucks. It doesn't come with a calibration certificate which is a big minus. A measurement microphone SHOULD have one. If some third parties could offer it for an extra $75, then sure Behringer could have added that cost on top of the microphone and sell it with that. I don't think that anybody would mind it if it was $75 dearer, as the closest next measurement mic in the market is above $500 mark anyway. Still, pretty good value for money overall, but without the calibration document it's pretty much useless for professional work, although for home users it may be adequate, just to give an idea of the room acoustics. I recommend to have it calibrated for any more serious work. Rated 5 out of 5 by Alberto Cotrina from Flat response Accurate, linear response, inexpensive. Rated 5 out of 5 by R.C. from Accurate Why buy the more expensive measurement mics when this one does what you need it to do, for half the price. Great Mic, Accurate Readings, and Rock solid construstion. Rated 4 out of 5 by Anonymous from Great inexpensive mic. This is a really inexpensive but good quality mic. I use it in my home studio to make demo songs on garage band. Rated 5 out of 5 by Anonymous from Fast Shipping, Exact as ordered, great!! Used for high end pro car audio. I could find this Mic nowhere else for such a low price and still be able to get in super fast in a box packed like it should be able to survive a 10,000 foot drop. The mic is awesome and totally flat response, needing no calibration. I bet it will stay that way as delicately as I will handle it. There's not a thing I don't like about this whole experience! Rated 5 out of 5 by Anonymous from Competes with the best I use this mic for its intended purpose, as a measurement mic for RTA (real time analysis) and it performs flawlessly. I keep the mic in one location, so I cannot comment on how well it travels, albeit the case it comes with is impressive and would likely cost the same as the mic, if purchased separately. Rumor has it that this mic is also good for acoustic recording. An excellent value. Rated 5 out of 5 by ddbruce from THREE Thumbs Up! I bought two of these after I saw them used to mic drums and to record a concert. I have to tell everybody, THESE ARE ABSOLUTELY PHENOMENAL! Extremely high quality, durable, and the best part: you can scream into it, and it won't clip! I highly recommend these microphones to anybody who wants an inexpensive, extremely high quality mic! What is the minimal sampling frequency needed for the ecm8000, assuming no filtering between ecm8000 and the ADC? Could this mic be good for recording sound effects?